Situated in Mascot, this hotel is within 6 miles (10 km) of Enmore Theatre, Coogee Beach and Maroubra Beach. Royal Prince Alfred Hospital and Royal Randwick Racecourse are also within 6 miles (10 km). Domestic Airport Station is 10 minutes by foot and Mascot Station is 17 minutes. 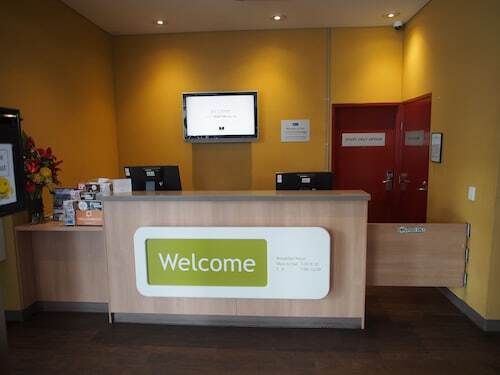 Situated near the airport, this hotel is within 3 miles (5 km) of Enmore Theatre, University of Sydney and Royal Prince Alfred Hospital. Broadway Shopping Center and University of Technology Sydney are also within 3 miles (5 km). Sydney St Peters Station is 13 minutes by foot and Mascot Station is 25 minutes. 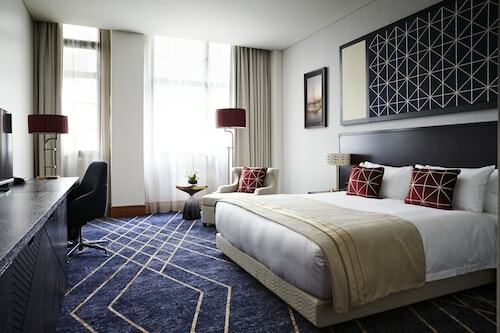 Located in Sydney Central Business District, this luxury hotel is within a 5-minute walk of The Galeries and Sydney Town Hall. Queen Victoria Building and Hyde Park are also within 10 minutes. Town Hall Station and Museum Station are within a 5-minute walk. 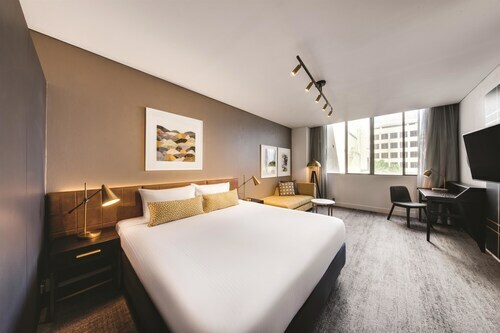 This family-friendly Sydney hotel is located in the historical district, within a 10-minute walk of Museum of Contemporary Art, Circular Quay and The Rocks Markets. 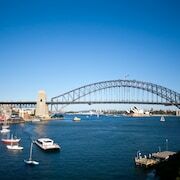 Sydney Harbour Bridge and Sydney Opera House are also within 15 minutes. Wynyard Station is 8 minutes by foot and Sydney Circular Quay Station is 5 minutes. 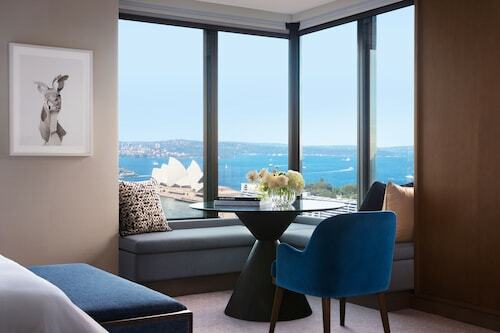 Located in the heart of The Rocks, this luxury hotel is within a 10-minute walk of Museum of Contemporary Art, The Rocks Markets and Circular Quay. Sydney Observatory and Customs House are also within 15 minutes. Wynyard Station is 8 minutes by foot and Sydney Circular Quay Station is 10 minutes. So, you're thinking about a holiday to Sydney? 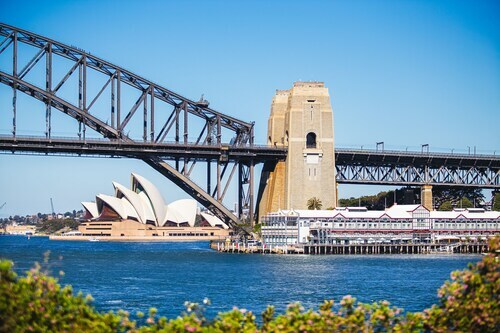 If you'd like to find accommodation that's close to the sights, you can enter your holiday dates and then use the filters beside your hotel search results to find somewhere to stay near the area's attractions such as Sydney Opera House, Sydney Harbour Bridge and Bondi Beach. 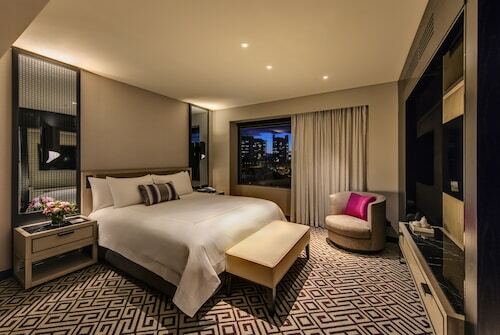 You can choose among 1458 Sydney hotels and accommodation choices to find a place you'd like to stay. 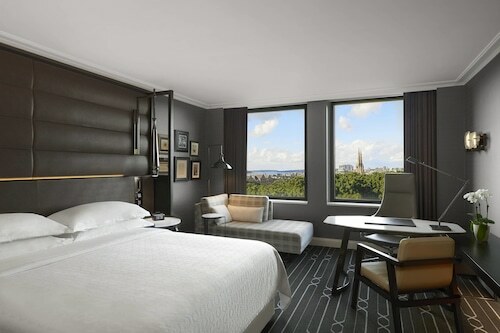 When you're thinking about where you want to stay in Sydney, you can easily and quickly search ebookers for hotels offering services such as high-speed Internet, a swimming pool or free airport transport. 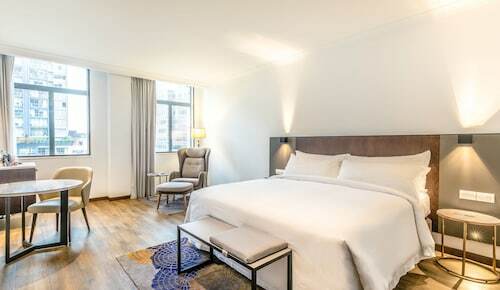 You can take advantage of the filters to narrow down your hotel search, so you can get the services that are important to you, such as an in-room kitchen or air conditioning. 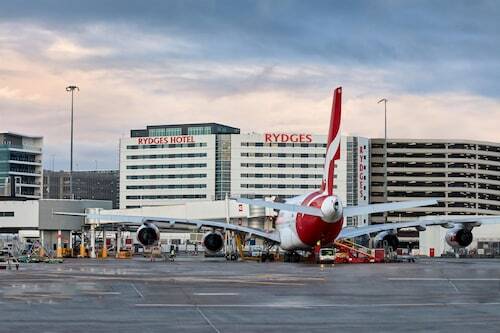 When arranging your Sydney getaway, you can also use ebookers to search for a convenient flight into Sydney, NSW (SYD-Kingsford Smith Intl.) Airport. You can narrow down your search by number of stops, airline or time of departure to find the one that'll work best for you. When is the Best Time to Explore Sydney? If you're curious when is the best time of year to explore Sydney, you may find this information about seasonal weather useful when you are planning your trip. The warmest months in Sydney are typically February and January, whereas the coldest months are usually July and June. The months with the most rain are April and May, whereas October and December have the least. From January to March, the average daytime temperature is 26°C and at night it is 16°C. Seasonal average rainfall is 320 mm. If you visit between April and June, you can expect an average temp of 23°C during the day and 8°C at night. Average rainfall during this season is 377 mm. The daytime average temp from July to September is 20°C and the nighttime average is 8°C. Average precipitation for this season is 273 mm. Between October and December, the average temp during the day is 25°C and 12°C at night. Seasonal average rain is 218 mm. The average annual rainfall in Sydney is 1188 mm. Lovely hotel and central great concierge and checkin staff .. dean was fantastic at concierge! Lovely new refurbished room wood stay agsin..
Tolle Lage, sehr freundliches und hilfsbereites Personal. (Wir haben etwas im Hotel vergessen und der Staff schickte es uns Express nach.) Hochstehende Ausstattung und genügend Platz. Grosser TV mit vielen Sendern, sowie sehr schnelles Internet. I’ve stayed here a few times and like the location and the rooms. There was a lot of building work going on in the hotel during this visit which caused a bit of disruption. I would have booked somewhere else to stay if I had known this. Great, modern hotel in a fantastic location. 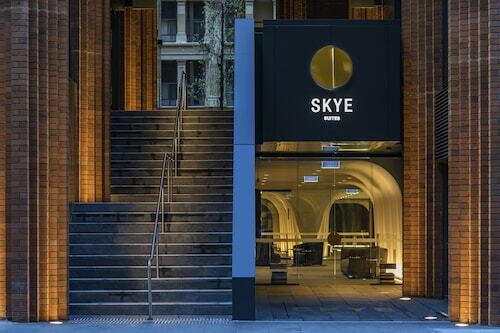 I like to walk everywhere and this hotel was perfect for exploring Sydney on foot. The room was very large and I appreciated the amenities (Nespresso machine, feal milk in the fridge, etc). The rooftop pool is quite small, but beautiful. There were several sun loungers next to it and the rooftop bar and lounge ares was a few steps down from the pool. The construction next door didn’t bother me, the room was very quiet. I’d definitely recommend the Primus if you want to stay in the clty (and I can be picky!). Lovely hotel just 10 minutes walk from the harbour ( Sydney Opera House etc). Lovely breakfast room and food. Stylish bar. The service at this hotel was extremely high. The staff constantly anticipated our needs. It made our stay very relaxing indeed. We stayed on an executive floor which was well worth the extra cost because of the view on the 35th floor and the use of the executive lounge. 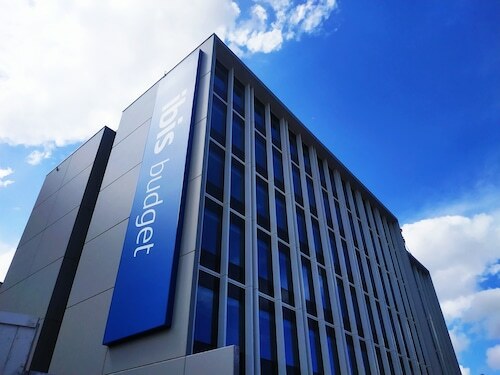 affordable accommodation, comfortable, suited myself as an individual somewhere you could sleep in relative comfort and go about during my stay while on holiday while not breaking the bank. My only gripe was the noise level of the air conditioning which although quite loud I was still able to get to sleep.